Tara Expeditions Foundation, is a French, ship-based non-profit established in 2003 by Agnès Troublé, founder and inspiration for the agnès b. brand and her son Étienne Bourgois, to celebrate their passion for the sea and their vision to see humanity live sustainably with our global ocean. For more than 12 years Tara, the legendarily tough, 36-meter aluminum hulled schooner, has been constantly on the move, traveling 300,000 kilometers across the world’s ocean basins —from Arctic and Antarctic ice to tropical and temperate seas across the globe using sophisticated marine science, education, conservation, and exploration. Tara has completed ten highly productive expeditions studying the impact of climate change and various ecological challenges from plastic pollution to coral reef destruction. 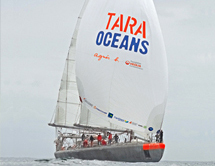 Tara Oceans Expedition (2009 – 2013) was an ocean odyssey that lasted 938 days of intensive sailing. It included an interdisciplinary team of 250 international scientists, artists, and journalists from 40 countries who spent three years uncovering new insights on the importance of plankton ecosystems and their genetic makeup, as 80 percent of all single cell organisms on earth are plankton and they play an essential role in Earth’s climate and biogeochemical cycles. The results from Tara Oceans scientific discovery were published in a special issue of the prestigious journal Science in May 2015, that included 35,000 research samples examining plankton interactions, genomes, and how plankton are impacted by temperature fluctuations. This data has provided the scientific community with unprecedented resources, including a catalogue of several million new genes that may help transform how we study the ocean and assess climate change. Tara Méditerranée (2014) was a scientific expedition focused on the environmental challenges posed by plastic pollution degrading the unique marine ecosystems that support 450 million people who live along the Mediterranean coasts in 22 bordering countries. Tara Expeditions works daily to increase environmental awareness among the general public and especially young people. Through its special consultative status at the United Nations, Tara Expeditions is also developing a long-term advocacy plan to mobilize civil society and encourage global leaders and politicians to enact legislation that will address solutions to protect our ocean and our planet.